Let me level with you: Some of us prefer watching puppies wrestle over toys to grown men tossing around a pigskin, and there's nothing wrong with that. Thankfully, Animal Planet has come to our rescue on Super Bowl Sunday with the Puppy Bowl. But, that begs the important question, how can you stream the Puppy Bowl? Well, unless you have a TV and cable subscription that includes Animal Planet, you may be out of luck. If you're included in that lucky bunch, however, I'll just let you know Puppy Bowl XII kicks off on Sunday, Feb. 7 at 3 p.m. ET on Animal Planet with returning teams Ruff and Fluff facing off in opposing green and yellow bandanas, respectively. In order to fill up the roster of 49 players in the Puppy Bowl starting lineup, the network "worked with 44 different animal shelters and rescue organizations" around the country to find adoptable star quarterbacks. Plus, the Puppy Bowl will again include the Kitty Half-Time Show (in case you're more of a cat person, or simply love all sorts of adorable animals) and Animal Planet will be introducing the Puppy Bowl Hall of Fame to honor veteran players and promote the adoption of older animals, not just puppies and kittens. 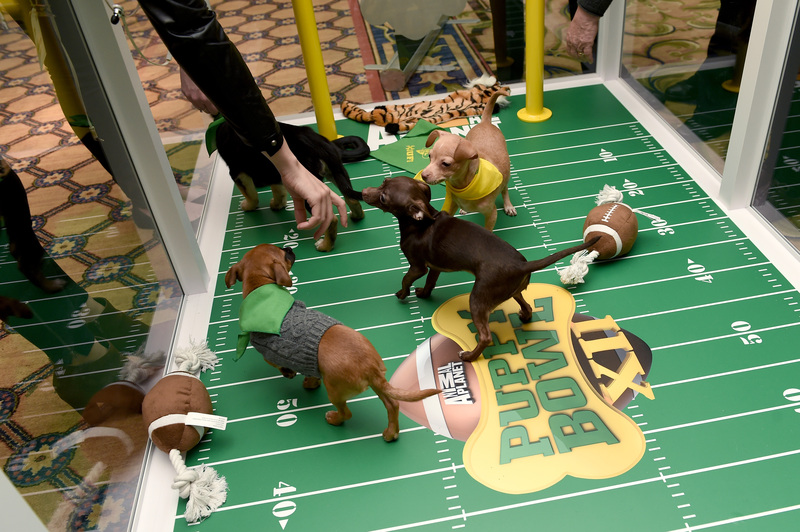 Unfortunately, if you don't have a TV and cable package, Puppy Bowl XII won't be available to stream online. Of course, heading to a friend's house and plopping down on their couch to catch the Puppy Bowl is a perfectly acceptable plan, but if that isn't an option, don't worry, there are other ways to get your puppy fix on Super Bowl Sunday! First off, Animal Planet's live puppy cam always has adorable canines to watch online. So while it may not have the football-themed fun of the Puppy Bowl, it still has puppies (and you can literally never go wrong with puppies). Plus, Animal Planet unleashed Puppy Bowl Virtual Reality so fans can catch the action online through the Discovery VR website and app as well as on Animal Planet's YouTube Page. Using VR goggles, you can check out these videos and feel like you're actually inside the Puppy Bowl — which, let's be honest, is so much better than simply watching it on television or online. Of course, whether you watch Puppy Bowl XII on television or if you check out the VR experience, nothing compares to actually hanging out with a puppy IRL. So, no matter how you plan to view the big game, get your dog and puppy-owning friends together to hold your own Puppy Bowl or Puppy Bowl viewing party. Don't have a dog? Well remember, the Puppy Bowl is an adoption event, so maybe it's time to adopt your own furry friend. I don't want to tell you how to live your life, but it's an (adorable) option.